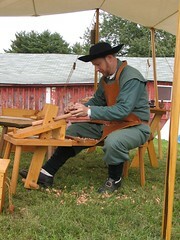 This past weekend Gardner's Company did a "presence" at an SCA event called Crusades. Its a rather large event between the East Kingdom and Atlantia. 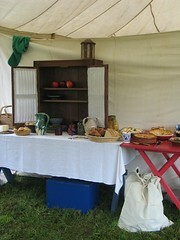 We set up in a tent by the Rapier field and set out a wonderful Arts and Sciences display. We did this venue as a recruiting effort however, the weather did not exactly cooperate. Up where we were it was damp, chilly, overcast, and breezy. Fortunately the rain stopped around 9:30 in the morning. Isobel made a stewed rabbit, smoked whiting, and baked eel, featured below on the center platter. There are two dishes of different kinds of cheeses, closer to those found in period. 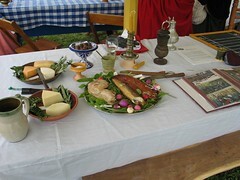 It all made for a wonderful display of the different sorts of foods Elizabethans ate. The photo album was put together by a Olivia to show off what other cool stuff we do. The idea was that a sign put in the Arts and Science Display area would invite folks to come down and visit us in person. While some people did venture down, I think the weather kept quite a few people away. 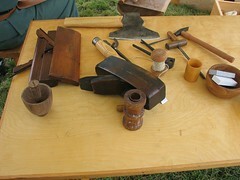 Tom also set up his wood working area with tools and examples of his work. Tom also brought his new livery cupboard (as seen at Pennsic) and we were able to sort of use in that sense. We put some food and pottery in the cupboard. Overall, I think it is worth the effort of doing a set-up like that in order to recruit and draw interest into our group. However, we may want to consider other factors of the event, such as weather, location, and whether we can show off other activities such as cooking or drill.